You may know David Koechner from his season on Saturday Night Live, or his work in films like "Anchorman" and "Talladega Nights: The Ballad of Ricky Bobby." You may know Dave "Gruber" Allen from his part in the cult sketch series "The Higgins Boys & Gruber" or as the post-hippie counsellor Mr. Rosso on "Freaks and Geeks." 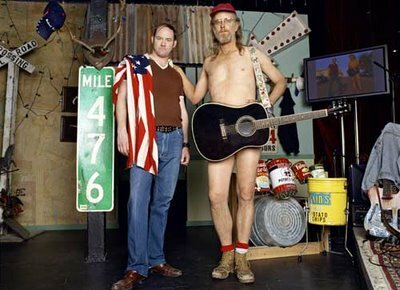 Together, these two have spent the last eight years honing "The Naked Trucker & T-Bones Show," a live stage variety show in which Koechner plays T-Bones, a demented redneck con-artist, and Allen plays The Naked Trucker, a trucker without any clothes on. That stage show's been adapted into Comedy Central series which premiers January 17th. We talked with Koechner and Allen about their long partnership and the new show. Please share your thoughts on the show in the comments section & on the forum!